Some friends had invited us to a day at the beach. However, Monday the 9th of December was a holiday and the thought of sharing a stretch of sand with a thousand other people was not that inviting. 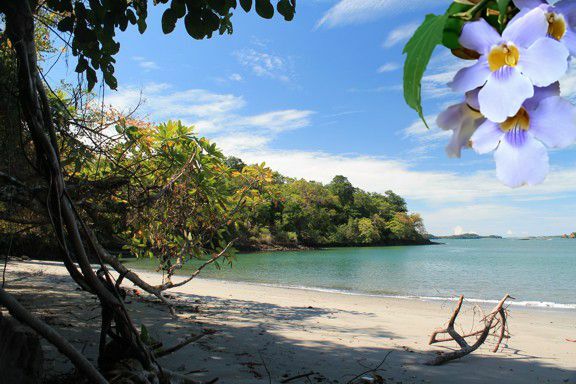 There are times to avoid the beaches in Panama; Easter, Christmas, holidays and long weekends. Our friends had chosen a beach on a desert island called Saino, which is just a ten minute water taxi ride south, from the dock at Boca Chica. 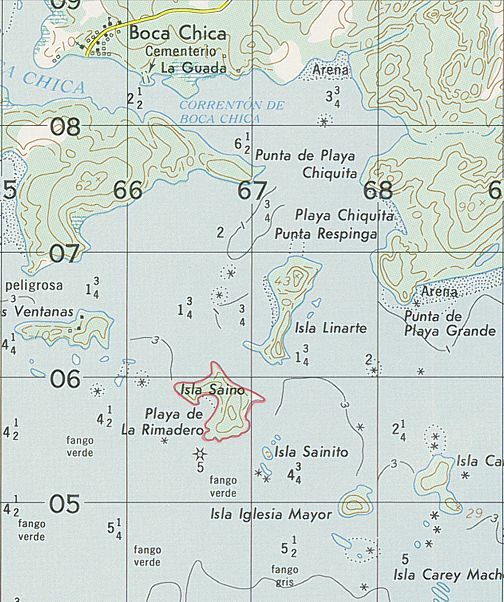 (See the attached map) Boca Chica is home to a new hotel, two sport fishing lodges and some upscale housing developments. 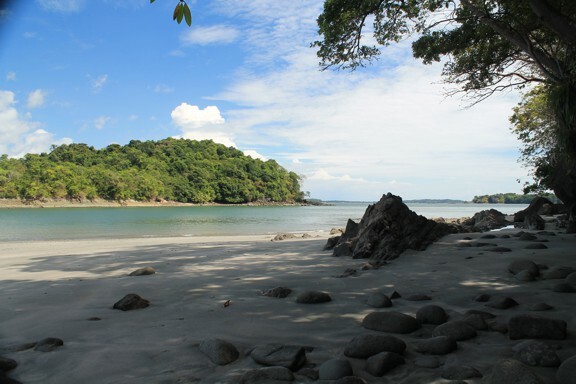 Boca Chica is about 40 minutes drive east of David City in Chiriqui, Panama. The weather forecast from Canada, the US and Britain was for snow, followed by more snow and accompanied by below freezing temperatures. This was an ideal time to spend a day soaking up the sun on a white sand Pacific beach. Explore a desert island, unwind and do some gazing down at a sand filled navel. "You're doing what?" "How can you do this to the family!" Just two of the many comments that I received when I decided to leave the states. 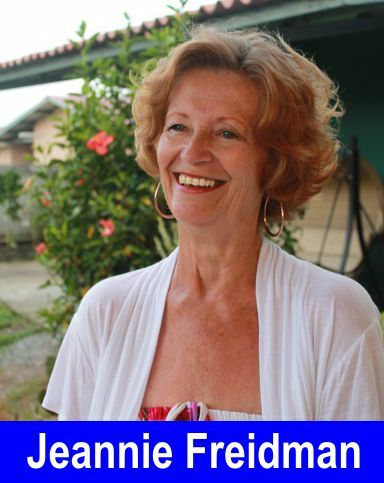 Of course it was difficult but something kept on propelling me forward . . .and after I did an 18-month stay in Nicaragua I followed some dear friends here to Panama and haven't regretted it one bit! The first question is what type person could commit to this lifestyle? She would need to be comfortable and enjoy her own company. Be strong in her convictions. Because, before, during and after the move she will receive all sorts of obstacles and comments from friends and family. Some will think you are crazy and others will be jealous that they do not have what it takes to set out on an adventure. An adventure it is. 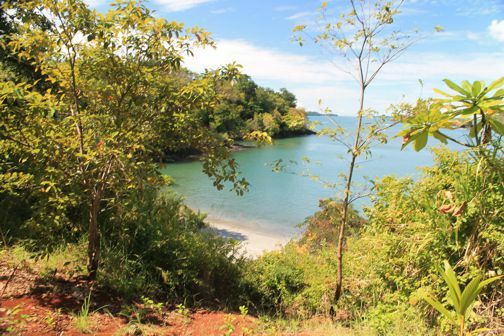 But once you decide on where in Panama you want to live and move - your life begins anew. 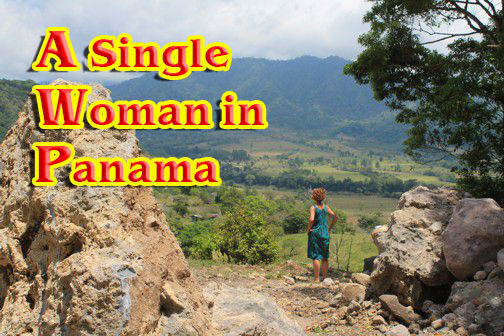 There are so many wonderful people that have chosen to move here to Panama and there is always a gringo ready with advice or to help. Please scroll down the page for this article. The water taxi left the dock at Boca Chica, a little after ten in the morning. The sky was blue with many puffy white clouds. The water taxi was a fibreglass "panga" with a 75 horse outboard. Ten minutes later it pulled into the western bay of Saino island called, Playa de La Rimadero. 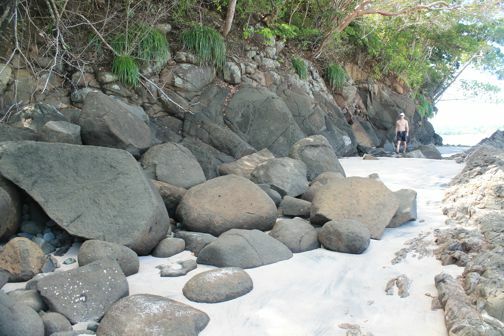 A whitish sand beach about 300 yards wide. 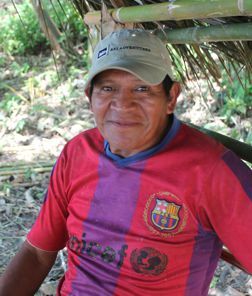 The resident island caretaker; a friendly Panamanian man called Felix, had built some bamboo and palm tree shelters on the beach. He did ask for a sort-of-donation of $1 for using them. In Panama, the beaches and the moon, belong to everyone. The first 22 meters from the high tidemark, are public. So, even if you are a millionaire and buy one of these islands, your 'private island' could still have hordes of people sunning themselves on your beach. 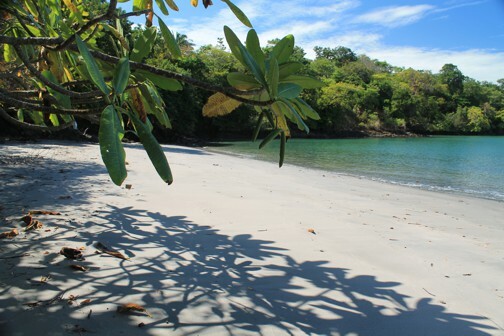 A warning, boredom can settle in quickly on these idyllic stretches of sand. Sadly today, most people are techno-addicts, and have to scan their smart phone or tablet every 30 seconds. This dreadful antisocial habit could ruin an otherwise wonderful day, so try - I know it will be difficult- but try to spend some time in electronic freedom. After an hour I decided to explore the island. Felix, the caretaker, had cut a rough trail up the side of the hill, so off I went. The top of the island was only about 60 feet above sea level, so the climb was easy. After a few minutes I saw through the trees, another beach down below. Problem; How do I get down there. I found an old rusted piece of angle iron and used this to hack a rough trail down through the bush. After 15 minutes or so I emerged on Saino Island's northwest beach. I was alone. This is a wonderful experience and I think everyone, sometime in their life, should experience it. Just let your imagination run freely. Pretend to be a survivor - a modern day Robinson Crusoe - imagine yourself after a shipwreck. Could I build a shelter, what could I eat, is there water? Entertain yourself with these fantasy's and boredom will fly away like the breeze in the palm trees. Sadly, the modern day scourge of garbage was just a few steps away. 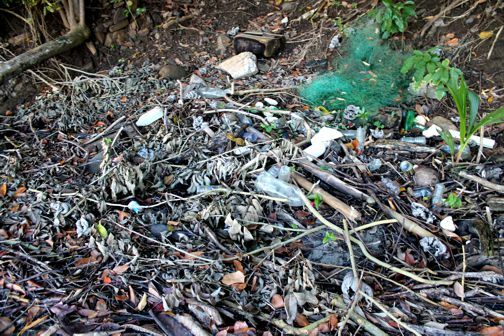 The tide had washed up a pile of plastic bottles and a bright green fishing net. 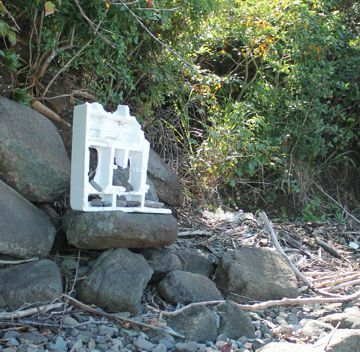 Further along the beach some wag had built a shrine to the eternal god of polystyrene. Weighted down with beach rocks, a discarded foam packing piece had been set up on a rock as a monument to man's inhumanity to his planet. Around the headland of this beach was a short stretch of pure white sand- yet another wonderful deserted stretch of isolation. Fortunately, the tides and wind kept this stretch free of any contamination. Like many things in life, there are places of untouched natural splendour- it's just that they are becoming harder to find. If you are reading this in some freezing cold, snow covered northern clime, and wonder if you can afford this "dream." The water taxi ride was just $7. The beach, the blue sky, the azure green waters and the soul lifting experience - they are all free. Some of the therapies offered are massage, reiki, aromatherapy. Additionally we offer nutritional counseling, and ozone therapy, acupuncture, colonic irrigation and ore. Beyond that is the social life. There is always something fun to do and participate in. First of course as even in the states there is "let's do lunch"! There are some fine restaurants here but sometimes we just want to enjoy the company of one another and make lunch at home and get together. Many us enjoy cooking and everything that one needs can be found here locally. If you cannot find it you can get it from the states. There is music and dancing. We have attracted some great professional and nonprofessional entertainers here to our little part of the world. What about horse back riding? You can trail ride here at one of our local coffee farms....not to mention all of the beautiful horse farms around us. January is the foaling month and it is so much fun to drive around and see in the fields the babies with there mothers! Hiking is abundant with professional people available to take you on one of the many trails. There are several hot springs to ease aching muscles and joints. Birding is a wonderful pastime here, There are many books to help you identify what you are seeing. Every Friday there is a veggie co-op where we go to socialize and get our weekly vegetables that are mostly organic. There always can be frustration with any move and certainly with a country that is considered third world. On top of that is the language difference. Life would eventually be better if one had a grasp of the language and ability to communicate. With all the expats around Volcan I do not know of many with that ability-- most of us struggle. The Panamanians are so kind they just smile and try to help us and correct what they can. Sign language and pointing also works well! Many Panamanians are trying to learn English--so as you struggle with Spanish they are also struggling with English. You may want to apply for permanent residency or the pensionado visa. If you decide to go that route there are several good attorneys that speak good English that would be ready to help you with the process. If you do not qualify you just need to leave the country every six months. From Volcan the Costa Rican border is close and we have two ways to go. To Paso Canoa for a day of shopping or to Rio Sereno and into San Vito, a town originally settled by Italians, for great pizza. So do your homework. Read websites and travel books but better yet - come see us and then you can make a well-informed decision. 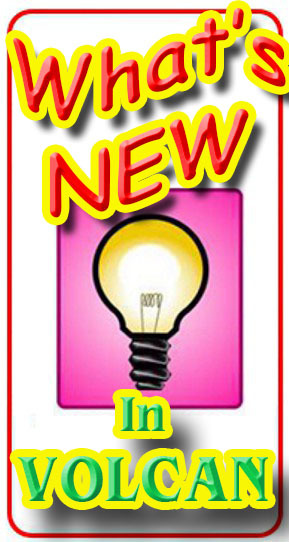 is now having music EVERY Saturday, starting at 2:30. 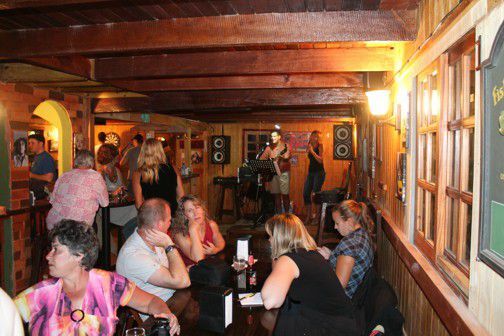 Because of the increasing amount of singers wishing to perform, Miguel, the owner of Deep Forest has extended the popular Saturday concerts to be held every week. For lovers of KARAOKE, we hope to soon have a regular feature where anyone can stand up and entertain us. In December Volcan's SEVENTH supermarket opened. This just shortly after the new BERARD market opened. Nearby Boquete only has two markets, so do we need another? Shoppers seem to say yes, as some prices are lower now in Volcan than in the mega stores in David. This can only be viewed as a sign of Volcan's growing importance. New sidewalks, a new bank, new supermarkets -be still my beating heart. 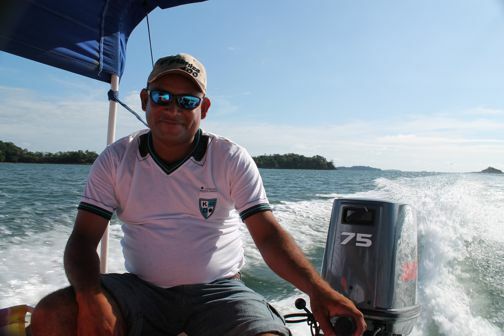 Last Friday, Jorgé, the manager of MANA'S restaurant took over the running of the former restaurant and cabin complex known as MOUNTAIN RIVER LAKE. This is one of Volcan's most scenic locations and we look forward to dining in the octagonal restaurant in the middle of the lake. NEXT month, we will do a feature article on this new and exciting Volcan attraction.